Owners of Texas and the surrounding states of Oklahoma, Louisiana, New Mexico, Arkansas and Nebraska pools and spas that are in poor condition due to wear and tear, abuse, or an accident, can have these pools resurfaced. Based on your pools foundation, there are a couple options to fix your pool. Our Fiberglass Pool Resurfacing Services are recommended for units constructed of ground gunite, concrete, or block and fiberglass walled with concrete bottoms. People commonly use vinyl, concrete and paint, or concrete and plaster renovation; but these materials are cheap, require more maintenance, and wear out faster than fiberglass. How is this possible? Fiberglass is better because a natural characteristic of the fiberglass material is being able to move with your pool during contraction and expansion during weather conditions, which cause serious damage to other materials, such as plaster and exposed concrete. What are your options for Pool Resurfacing? We resurface existing pools made of gunite, fiberglass, or a “combination” (a combination pool is made with either fiberglass walls or metal walls and a concrete bottom) with new fiberglass. We have yet to meet a pool we cannot renovate and remodel! Fiberglass Pools maintain their shape in any condition, and they require much less maintenance. We offer a variety of colors for your fiberglass pool surface: white, light blue, blue, medium blue, and blue-green. Our fiberglass pool surfaces will bring sparkle, splendor, and sustainability to your pool for generations. 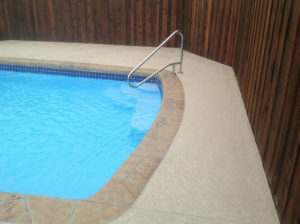 Contact us today to learn more about resurfacing your pool with Texas Fiberglass Pools Inc. Fill out our short form to get immediate help with your Fiberglass Pool Resurfacing Project.